I woke up in the pleasant town of Puerto Varas late on Sunday morning, having spent the night at a comfortable hostel just outside the city. Puerto Varas is 20km north of Puerto Montt, southern Chile's last easily accessible port city via road. 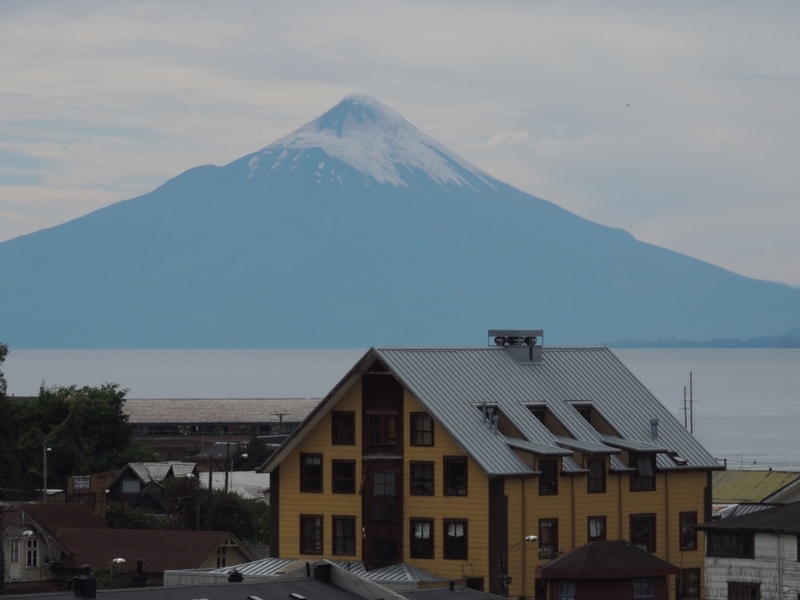 It offers beautiful views of Volcán Osorno, which is noted worldwide for its similar appearance to Mt Fuji. I took some time to walk around the city the day before and stock up on basic food supplies for heading to Chile's vast 1400km stretch of Patagonian wilderness, which is considerably less accessible by road. Since leaving the comfort of Pucon and Villarica I had been coming to the realisation of just how difficult (and expensive) Chilean Patagonia is to access. In my planning, I hadn't so much underestimated the time and effort involved as I had the cost. Travelling south via bus suddenly doubles in cost, and any crossing into nearby Argentina can cost as much as 10 times the amount I had become used to. I was kicking myself for overlooking this in my planning as I desperately searched for answers in my guidebooks, sitting on a bench with all of my worldy possessions in central Puerto Varas. I steadfastly refused to break my budget unless absolutely necessary, a $50USD bus trip to Bariloche, Argentina (just 25kms across the border) and any extra unnecessary travel south in Argentina was out of the question. If I stayed another night in Puerto Varas I knew that I would begin to lose momentum, I had to keep moving towards my intended next southern destination of Chaitén. The 23:00 ferry from Puerto Montt, the only option leaving that day, (taking 8 1/2 hours overnight) for $16000CHP ($32AUD) was expensive. Anyway, it seemed like I'd be taking the easy way out. Reading the guidebooks and region maps, I traced the path by land/water to Chaitén. No bus service runs the route direct, which is approximately 200km and considerably more difficult than it sounds. 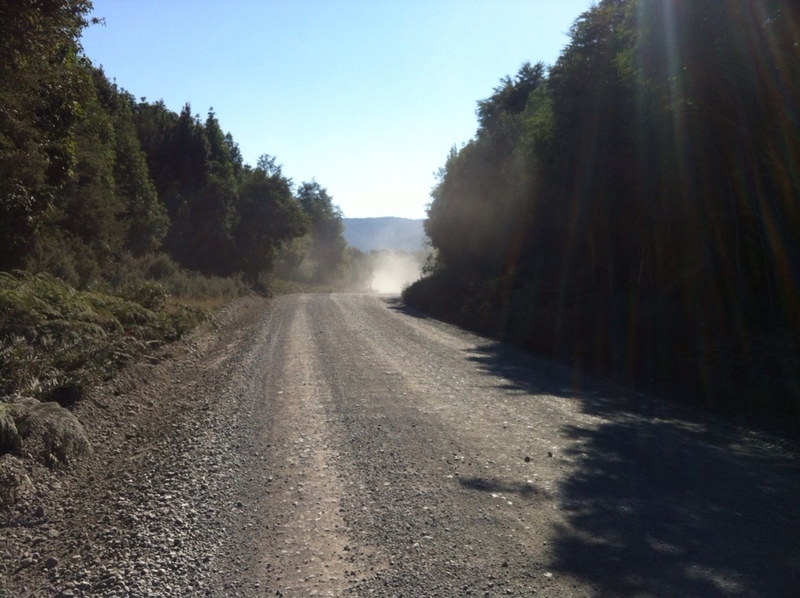 The Carretera Austral road stretches 1240km south of Puerto Montt and remains largely unpaved. It has only recently joined several small towns previously only accessible by ferry from Puerto Montt and other small port towns. If I was going to make it to Chaitén, I would have to walk, hitchhike and catch three ferries to get there. 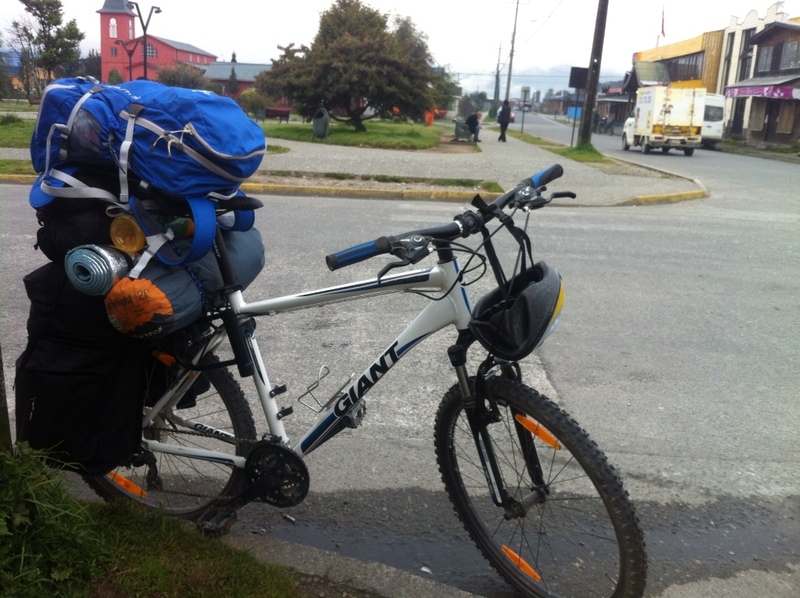 I shouldered my heavy pack, and started walking towards the highway to the next town, Puerto Montt. 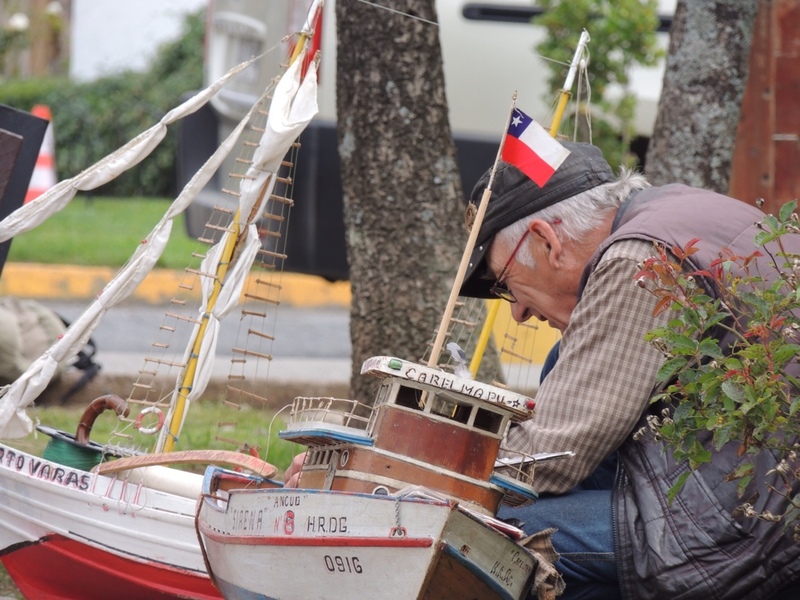 A man builds motorised scale model boats on the pier, Puerto Varas. With renewed energy, I followed my local map towards the busy highway heading south. Walking out of the small port town of Puerto Varas is no easy feat, involving a relatively steep, 1.5km climb to the highway and toll point. Thankfully, the hitchhiking fairy must have been smiling down on me as a white car swerved to the right in front of me, kicking up a cloud of dust and blasting its horn. A hand motioned out of the window for me to throw my bag in the back of the compact hatchback and climb in. 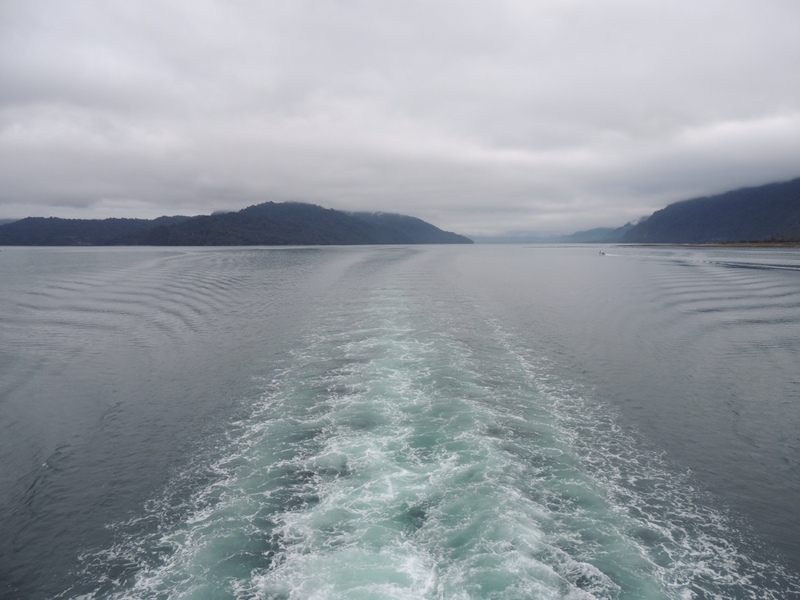 Having been given the lift to the highway so quickly, I was grateful again when a father and son pulled over soon afterwards and said they were going to Puerto Montt. Twenty minutes later I visited the local Oficina de Turistica, obtained a free detailed region map and worked out the rough route I would need to take for the day. With the small towns worked out, I started making my way out of the city. 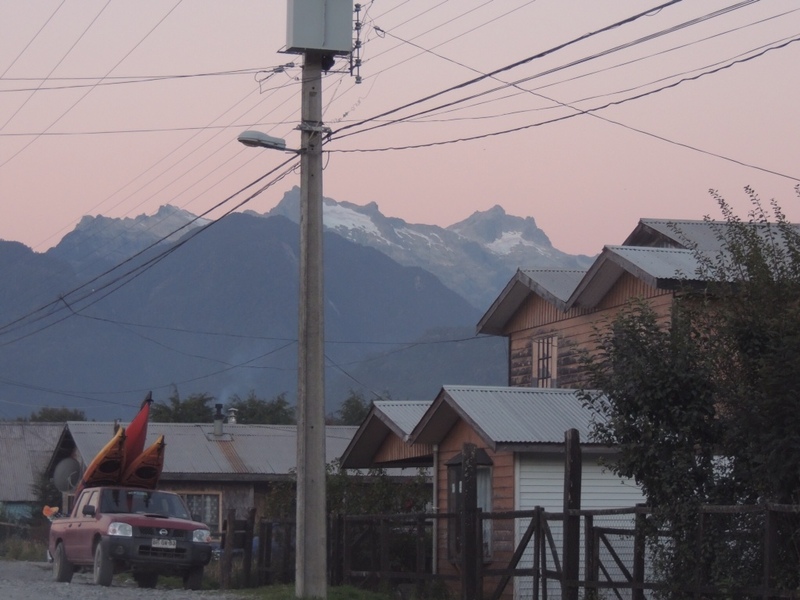 I passed three Chilean hitchhikers on my walk out to the next town, Pelluco, also making their way to Chaitén. The rest of the day would result in a number of amusing crossovers, as we hitched lifts with various strangers also making their way south-east and kind enough to share the journey. 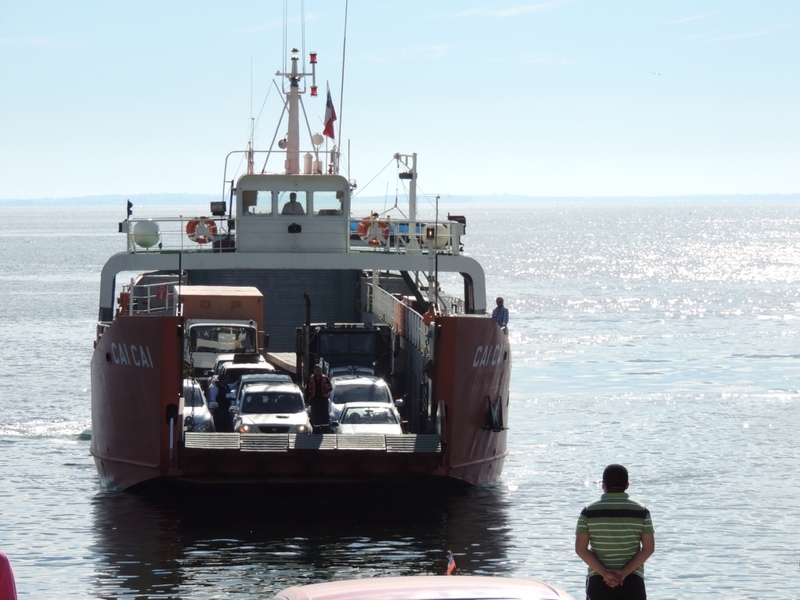 The first ferry crossing is at a small town called Caleta La Arena, only recently joined by road to Puerto Montt. After securing five short rides towards my destination I found myself 30km out of Puerto Montt and past the point of return. After another 30 minutes of walking along beautiful paved road bordered by towering mountains, a familiar car heeded my pleading thumb and swung over in front of me. A man who had given me a short ride just over an hour ago had now picked up his mother and was heading non stop to Caleta La Arena! Thrilled, I threw my bag on the back seat and settled in for the remaining hour-long trip. The road curved around to the south and climbed a hillside eventually becoming completely unpaved with steep, deadly drops just centimetres away on the right side. Due to ongoing and extensive roadworks to make the Carretera Austral more accessible the road occasionally becomes single lane only, with stationed roadworkers to direct the traffic safely while they lean on signs and look in the opposite direction. Despite the constant threat of certain death as large freight trucks passed just millimetres away from us, the drive offered stunning scenery of the Chilean mainland, snow-tipped Andes and multiple islands dotted across the ocean to the south. The gravel track descended into Caleta La Arenas and ended as the paved part of the road disappeared into the ocean. I thanked my driver and his mother as the ferry pulled in to the makeshift dock, paying just $600CHP ($1.20AUD) for the 30 minute ferry ride to Caleta Puelche, 10km from my destination for the night, Contao. Despite pestering a sleepy truck driver, I couldn't find a lift from Puelche to Contao. Looking at my watch I noted that it was 5:30pm, giving me enough time to walk the 10km to Contao before dark if required. Feeling the cold, I pulled my jumper closer around myself and strapped my backpack around my waist and chest. Knowing that there would be no traffic behind me until the next ferry arrived, I walked for a solid hour before suddenly being passed by a convoy of vehicles (at least 10). None of them stopped. Slightly dejected, I walked for another 20 minutes before finally being picked up by a couple of roadworkers who dropped me a kilometer from Contao. I walked the last 10 minutes, passing some shady looking Hospedajes before settling for one that looked as if it might at least have a shower. It did. And wifi, which was a pleasant surprise I wasn't expecting. A friendly rooster made sure he woke me up when he did: at 5:30am. A low cloud had settled upon Contao by 6:30am, obscuring the surrounding mountains and leaving a fine carpet of dew on the landscape. My body ached from yesterday's walking and I was very comfortable as I enjoyed a long breakfast of fresh bread and homemade jams at the $5000CHP ($10AUD) per night hostal. Finally, gathering my things and having enjoyed a hot shower, I left the comfort of Contao by foot at 10:45am. Some brief discussion with a local police officer ensured that I was on the right path to the next ferry town of Hornopirén. In fact, there was only one road. This sounded promising, as any traffic heading down the 52km route would surely have the same destination as I did. The bright morning sun broke the heavy fog, and as I began my walk along the Carretera Austral I was greeted with magnificent views of vertical mountain peaks, dense national park forest and picturesque coastlines. I kept a steady pace for the first hour, only seeing two vehicles which were both heading in the opposite direction. I walked over numerous small bridges crossing rivers running down from the Andes. As I walked further along the road, development became less and less obvious, with the occasional sign of life being a slow puff of smoke from the chimney of a small rural home. Two hours later, having passed a marker indicating I had walked 10km, I was still yet to be passed by a vehicle going in my direction. I knew that the flow of traffic would depend on the ferries docking at Caleta La Arena, so I pushed on. Fifteen minutes later, I heard the distant rumble of gravel behind me. Walking around a corner and not standing in an ideal spot to be visible I spun around and stuck out my thumb as a red ute shot past in a flash of dust, spitting gravel in my direction. Knowing that more cars would follow, I slowed my pace as I reached the end of a long stretch of road and waited for them to come. And come they did, in the space of twenty minutes I was passed by at least twenty cars, trucks and vans, not one of them stopped. Some drivers ignored me, those who I made eye contact with indicated with their hands that they were returning – to where? I pushed on, feeling the pain in my feet and shoulders growing with every step. After three and a half hours I was beginning to lose my steady pace. Each gradual descent in the road provided some relief but was then punished with an equally steep ascent. I stopped to rest and drink some water in a small bus shelter, 16km from Contao and still 36km from my destination. Twenty minutes later, a lone truck indicated a new flurry of vehicles making the crossing. I turned and stuck out my thumb, unashamedly throwing my hands together indicating some sort of hitchhiker's prayer to the truck's driver. My prayer was answered, his hazard lights illuminated as he pulled over and threw open his passenger door. I gratefully threw my bag into the middle seat and slumped into the passenger seat, thanking the driver in enthusiastic Spanish. The condition of the road meant that the remaining 35km took another hour to cross. I chatted to the driver in my usual (but improving!) broken Spanish and we swapped stories about our lives. As we drew closer to Hornopirén, I enquired about the next ferry. “Mañana”, he said. Tomorrow? Suddenly I realised that Hornopirén would be my destination for the day. The driver explained that at this time of the year, the 5 hour crossing was only made once daily, at 10:30am. I thanked him for his help as we drew into the quiet coastal town and he directed me towards a couple of local Hospedajes where I could find a place to stay for the night. I checked in to Hostal Cuatro Soles shortly afterwards and as I lay on my bunk I actually felt a bit grateful that the day's walking was over and I had time to catch up on some reading, writing and relaxation. I was almost halfway to Chaitén. I woke up sorer than I had the day before, knowing that I had a much more comfortable day ahead of me. 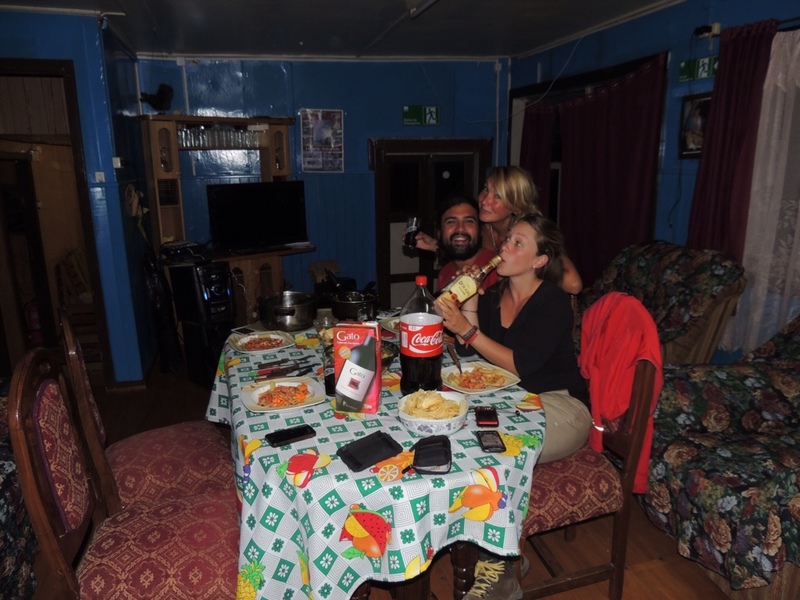 Some conversation with the hostal owner the night before had helped me plan the rest of my trip to Chaitén and further south. After the ferry leaves Hornopirén at 10:30am, it is a four hour trip to Leptepu. From there, it is a short 10km crossing over the mainland to make the third and final ferry trip from Fiordo Largo to Caleta Gonzalo, from which the Carretera Austral stretches south unbroken (and passing Chaitén) for the remaining 1000km. My hostal owner explained that if I couldn't get to Fiordo Largo in time for the only ferry, I would be stuck, only this time with no accomodation or camping facilities whatsoever, in Caleta Gonzalo. The only alternative was to take a comparatively cheap, $7000CHP ($14AUD) bus directly to Chaitén, covering my ferry fees (which would have totalled more than $10000CHP anyway) and ensuring an easy, comfortable passage. Although part of me was disappointed to be taking the 'easier' option, this was also the more sensible option. With the threat of poor weather over the next couple of days, I booked my bus ticket for 10am on Tuesday morning. After an unusual breakfast which consisted of 1cm thick slices of American sandwich meat, I thanked my hosts and walked across to the bus stop. I met a father and daughter from Valparaiso who were cycling their way down to Lago Tranquilo, just past Coihaique, 400km south of Chaitén on the Carretera Austral and a place I intend to visit. I was impressed with the fact that Chileans were so willing to adventure in their own country and appreciate what their home has to offer. Something that I think we often take for granted in Australia is the beauty on our doorstep in our rural towns and brilliant coastal outskirts. Having said that, it is ironic that it is cheaper for me to see the wonders of South America during a year-long vacation than it would be back home. The weather turned as we drew closer to the end of the final ferry trip, and cloud descended around the mountain peaks. The quality of the road deteriorated even further and the bus driver was sure to keep everyone awake by hitting as many potholes as possible. As the bus zoomed down the narrow and often single lane highway around blind corners and past steep drops to multiple rivers below, it became difficult to distinguish cloud from dust as the scenery became ever more obscured. Luckily, my iPod was having the shuffle of a lifetime and Gotye, The Kaiser Chiefs, The Stereophonics and alt-J made a perfect accompaniment to the last hour of the journey to Chaitén. Not expecting to find company in the small town, I was lucky enough to meet a pair of Swedish backpackers and a Chileno student from Santiago. 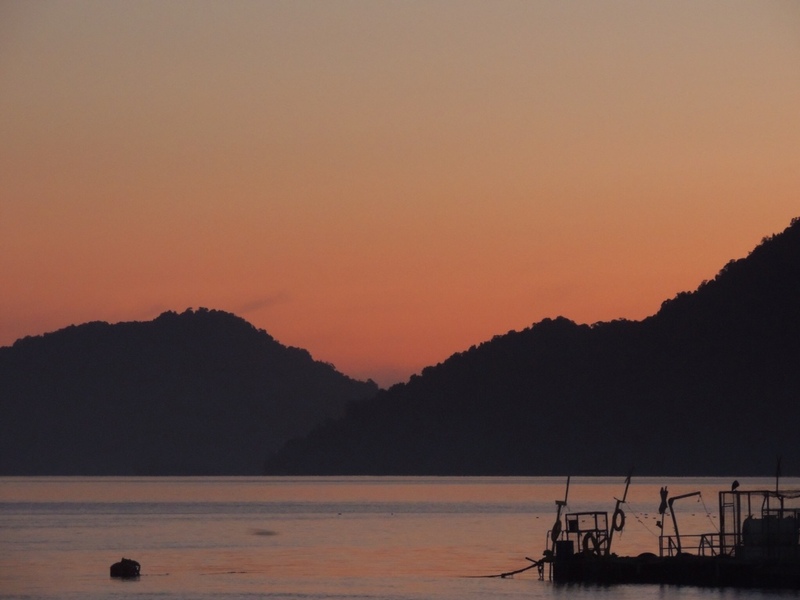 We ended up finding the cheapest (and possibly most unfriendly) hostal in the area. Yet again, I was fortunate to be with a another great group of new people on my travels. We had a birthday to celebrate too! I head south again from here to explore some small towns and local parks reputed for their accessibility and beauty for hikers in Patagonia. The cost of transport in Argentina means it is likely I will head north to visit some friends before moving on to my next major destination, Buenos Aires, Argentina. ← Valdivia: Fresh Fish and Forts. Yo Teddy and buenos nochas mi amigo from El Chris y Bridget la parentos of Roberto in Stafford England…… You would not believe that we have just returned from Chile and Argentina ourselves. We were in Santiago until the 4 Feb so it looks like we only just missed you…small world! We moved from there down to Osorno where we stayed with our neighbours from Stafford who also have a house there. We also visited Puerto Montt and stayed in Punta Arenas and Puerto Natales in Patagonia. We later returned to Osorno before going to Temuco and back to Santiago on 25Feb. We visited Calafate in Argentina and went to see the Perito Merino glacier which was amazing. We also went to San Martin de Los Andes in Argentina which is not too far from Bariloche which I see you mentioned…there was some impressive scenery crossing the Andes and then driving through the Seven Lakes to San Martin. Hi guys! Great Spanish I see you picked up while you were here, and so considerate of your son to let me know you were here! Sorry we didn’t get to bump into each other and say hello. You sound like you had a fantastic trip! I’m still hitchhiking south and I’m less than 500km from El Calafate after walking across the border yesterday. Things are getting difficult though and I think I might have to splurge tomorrow for an expensive bus trip to El Chalten. It’s great hearing from you and I hope you’re enjoying reading the blog as much as I am writing it. If you have any photos of your own, we’d like to invite you to participate in our new photo challenge! The best pictures will be published on our website with a link to your blog! Thanks for the invite! I’ll keep an eye on the website.